The Sony E50mm F1.8 OSS Lens is a bright, fast, medium prime lens well suited for portraits and general photography. The f1.8 maximum aperture brings the subject in sharp focus whilst creating a soft, smooth blur effect for the background. Combined with high quality optics, wide aperture and Optical SteadyShot, the E50mm F1.8 is the perfect lens for handheld shots in low light conditions, ensuring crisp images with minimised distortion and chromatic aberration. 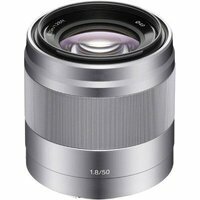 This lens is designed for Sony's APS-C E mount cameras.